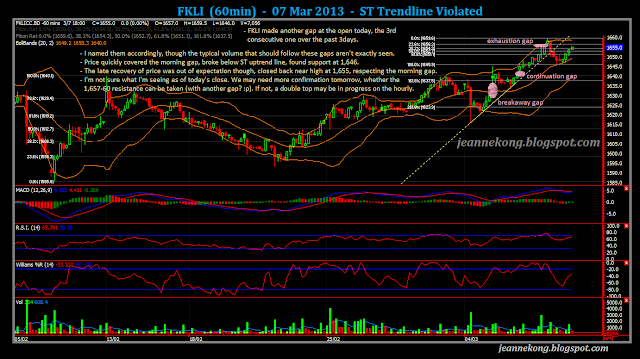 Well, FKLI did a quick U-turn back up after my midday post earlier. Although the morning gap at 1,655-57 was respected, the closing at 1,655 (yesterday's close) was still a little ambiguously high for a potential wave B of an ABC correction (my initial perception of today's price movement). Hence, I'll keep that view aside for now, wait for a confirmation tomorrow, as to whether we are done with the retracement at 1,646 today, & looking at challenging the 1,660 resistance overhead. Or, we may well see a slightly higher open tomorrow, forming a double top, & continue today's half-way-through retracement. Anyway, closing back at 1,655 formed a hammer-like candle on the daily, which smell a little bullish after hitting a day low of 1,646. A lower than average volume did not give much support, though. Nevertheless, the close manage to push price securely above the daily uptrend line. Mixed signals on daily & hourly....So, we wait for confirmation tomorrow. I show the hourly chart here, which gives a clearer picture of what happened over the past three days. 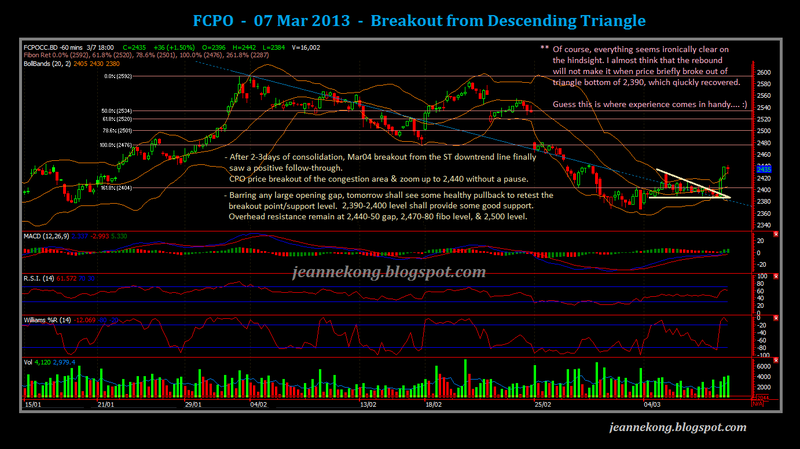 CPO finally tells us where it wanna go today, breaking out of the descending triangle, emerging above it & zoomed right up to 2,440 resistance level, no looking back. Well, it still has to come back to retest the support after hitting resistance at 2,440. Momentum has clearly weaken, minutes before the closing bell, though price is still able to hold within 2,430-40 range & closed at 2,435. Expect some retracement tomorrow morning, after which may see another attempt to break through the 2,440-50 gap region. * Provided we do not gap right over it at tomorrow's open. 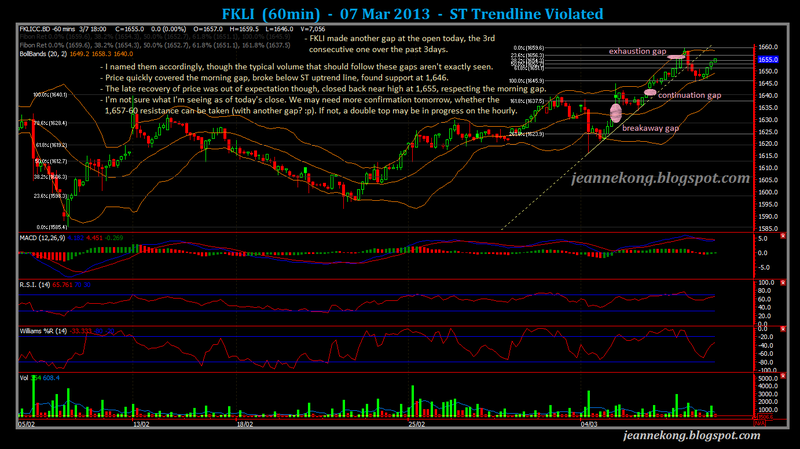 Remember what happened to the 1,640 resistance level for FKLI?? Today's spike provide a solid follow through to the breakout from the ST downtrend line on Mar04. Reiterating overhead resistance at 2,440-50 | 2,470-80 | 2,500 levels. Strong support remain at 2,390-2,400, of which price shall not close back below, if the current rebound is to continue. However, an Feb'13 crop data & export summary report due on Mar11 (Monday) may cause traders to avoid bringing position over the weekend. Squaring off of positions may caused some price fluctuation tomorrow.